Will RBS Ever Be Free Of Criminality? Is It Possible? Royal Bank of Scotland Group Plc said there’s a risk that costs for past misconduct will keep rising and took a restructuring charge of 847 million pounds ($1.3 billion) in the third quarter as Chief Executive Officer Ross McEwan seeks to clean up the lender. 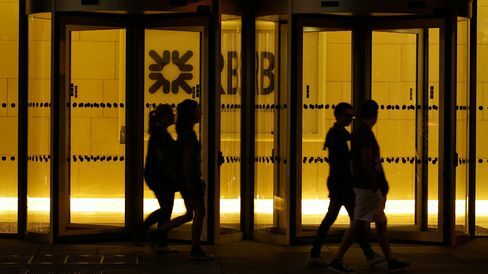 Pretax profit before one-time items and restructuring costs fell to 842 million pounds from 2.05 billion pounds a year earlier, Edinburgh-based RBS said in a statement on Friday. Analysts forecast a profit of 988 million pounds, according to the average of eight estimates in a company-compiled survey. British banks remain plagued by costs tied to past misconduct, as they shrink the securities units that sparked billions of pounds in fines and weigh on earnings. Barclays Plc on Thursday forecast conduct and litigation costs to remain “elevated,” when cutting its profitability target for 2016, a day after Lloyds Banking Group Plc said it may have to set aside an additional 1 billion pounds in redress charges. At RBS, 58-year-old McEwan is trimming the securities unit, cutting thousands of jobs and selling assets to focus on consumer and commercial lending in the U.K. and Ireland. The bank eliminated around 1,000 jobs this year as it exits 25 countries, he said. The loss at the unit housing RBS’s securities unit almost doubled to 1 billion pounds in the third quarter from 557 million pounds and revenue fell by almost half. The division had a loss of 268 million pounds when costs tied to litigation and restructuring are excluded, compared with a profit of 21 million pounds a year earlier. The lender, which employed more than 197,000 people in 2008, said in the statement it continues to tackle “legacy issues,” further “material and incremental costs and provisions in respect of conduct and litigation related matters are expected and could be substantially greater than the aggregate provisions” made. At Lloyds, pretax profit before one-time items fell more than analysts estimated in the third quarter, partly hurt by a slide in revenue at the unit housing fixed income and currency trading. Barclays said that pretax profit, including restructuring charges, fell 10 percent to 1.43 billion pounds in that period, missing analysts’ estimates. The shares of all five major British lenders have declined this year, with Standard Chartered Plc the worst performer. RBS, which is still owned by the government, has declined about 20 percent, while Barclays dropped 3.9 percent. Lloyds is down 2.4 percent. In the third quarter, RBS cut risk-weighted assets by 10 billion pounds to 316 billion pounds, with the bank targeting cost cuts of more than 900 million pounds this year, up from a previous 800 million pounds. It also took a 1.1 billion-pound accounting gain on the reduction of its stake in Citizens Financial Group Inc. Unlike Lloyds, RBS and Barclays didn’t take another provision to help cover wrongly sold payment protection insurance in the third quarter. British lenders have set aside about 26 billion pounds in the country’s costliest scandal since the financial crisis. RBS Chief Financial Officer Ewen Stevenson said that the bank will have to work through the “bulk of our conduct and litigation provisions,” most of its restructuring program, and achieve “very, very good stress test results” in 2016 before resuming dividends. HSBC Holdings Plc is scheduled to report earnings on Monday.